Quality early care and education is an essential two-generation resource for national, state and local economies. Early care and education professionals allow families the opportunity to participate in the workforce and achieve self-sufficiency while also providing safe, learning-rich environments that lay the foundation for children’s school and life success. 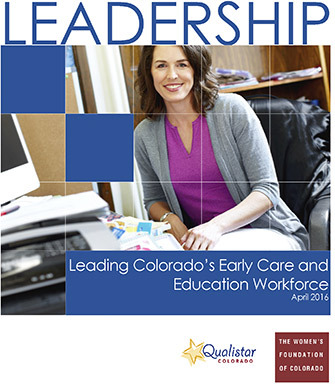 Leading Colorado's Child Care and Education Workforce, executed by Qualistar Colorado with support from The Women’s Foundation of Colorado, identifies primary characteristics of professionals who lead early care and education centers and preschools. Included with research results are recommendations that aim to support leaders as they manage change and lead improvements to the quality, access, and affordability of their critical services for families, young children, and their communities. Early care and education leaders, administrators, and teachers provide an invaluable service, but their compensation does not reflect their critical role in children’s lives and in the community. Low teacher wages make it challenging for early care and education leaders and administrators to find, hire, and retain qualified professionals. Support is needed for early care and education leaders in the management and implementation of historic change.